This memorial is currently in the care of Cliffe Castle Museum. It was previously on the wall in Fell Lane Wesleyan Church, Fell Lane, Keighley, before the church closed. There is an article about this memorial in the Keighley News from 9th September 1994, a copy of which is held in the scrapbook archive in Keighley library. The memorial is made from oak and is a wooden board with pediment. Names in the central part within a moulded frame and dedication at the top. Inscription in gold painted lettering. 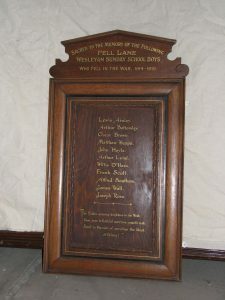 Total names on board of those who died, 11. SACRED TO THE MEMORY OF THE FOLLOWING/ FELL LANE/ WESLEYAN SUNDAY SCHOOL BOYS/ WHO FELL IN THE WAR, 1914 - 1919.